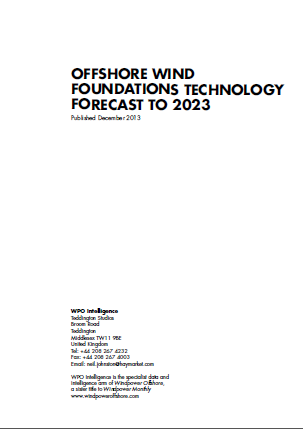 Based on extensive primary research this study Offshore Wind Foundations: Technology Forecast to 2023 is the essential planning and strategy guide to developments within the fast growing offshore wind foundations market. This major new study identifies and profiles the technologies expected to affect the sector to 2023. The report illustrates the technological trends and drivers, shaping the development of the sector and incorporates exclusive ten year market forecasts. A critical decision for the developer of any offshore wind farm is what foundation to use beneath turbines, and that choice is not easy. A multitude of environmental and economic factors must be weighed. Once dominated by only a handful of suppliers, the foundation sector is now attracting new participants jockeying for position. Nearly four-fifths of the global offshore wind resource is situated above waters deeper than 60 metres. The foundation technology commonly found in operating offshore plants, the monopile, is generally designed for maximum depths of 30 metres. Another dimension of offshore wind that companies must consider is distance from shore. The greater the distance, the further construction and maintenance crews must travel, increasing cost and constricting access windows. 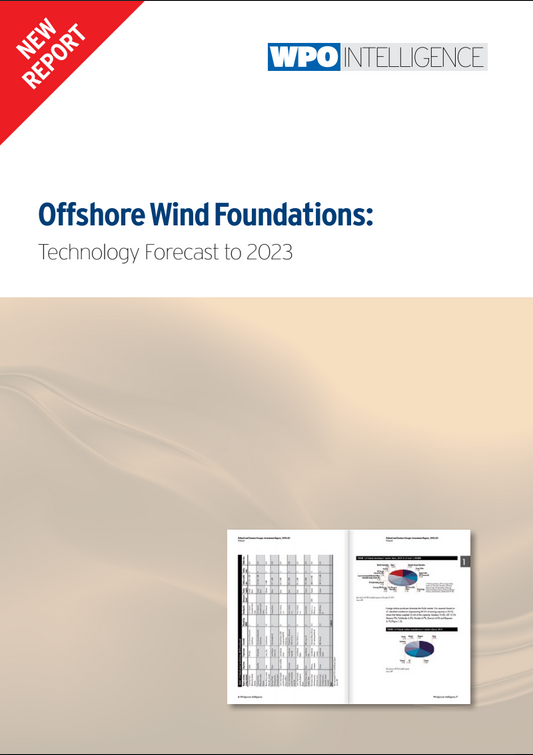 This report analyses the relationship between foundation technology types and project depth and distance in major offshore-wind markets. Meantime, the emergence of designs for floating turbines is prompting intriguing questions about offshore wind farms going forward. Another key stakeholder in the offshore wind sector are the shipbuilding industry, which is rapidly adapting to demand for safe and efficient transport of crew and equipment to offshore sites. No less interested are municipal port authorities, which are aggressively vying for leadership. The WPO Intelligence database of offshore wind farms was used to extract data for the graphics and tables in this report. 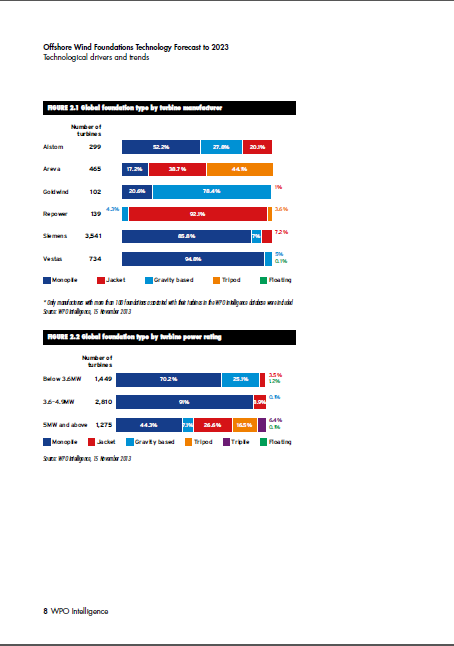 We used a snapshot of the data that was taken on Friday, 15 November. Any foundation supply contracts information that we became aware of after that date will not be reflected in this report. Data were only drawn from 'active' projects - those that were listed in the database as being either 'in progress' or 'online' (388 in total). We excluded projects that had either been inactive for a long time (classified as being 'dormant/on hold' in the database) or were recorded as having been cancelled by the relevant developer. 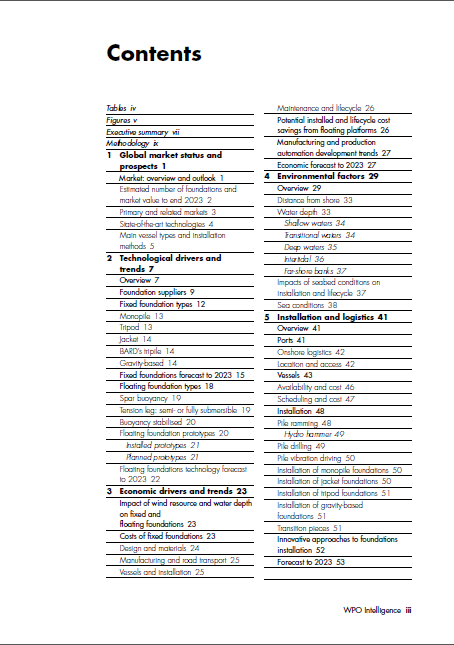 Of the 388 active projects, WPO Intelligence holds foundation type information for 152. Foundation demand forecasts were based on the assumption that the demand would materialise in the year preceding the year when the relevant offshore wind farm was estimated to come online according to data held in the WPO Intelligence database. Details on turbine numbers and size from known turbine purchase agreements. Average turbine size of 4.7MW - based on average turbine size for projects due online in 2015-18 where turbine size is recorded in the WPO Intelligence database. Additional average capacity of 11-13GW/year - based on recent BTM Consult forecasts. Average turbine size of 6.4MW - based on information in our database combined with known market trends for turbine size. Regional foundation demand to be the same proportion of global demand as in 2018 according to WPO Intelligence data on known planned projects. Demand ranges were produced in line with the 11-13GW/year range used in the forecast of installed capacity. To forecast market value, the capital expenditure associated with a foundation was assumed to be approximately €0.8 million per megawatt installed. 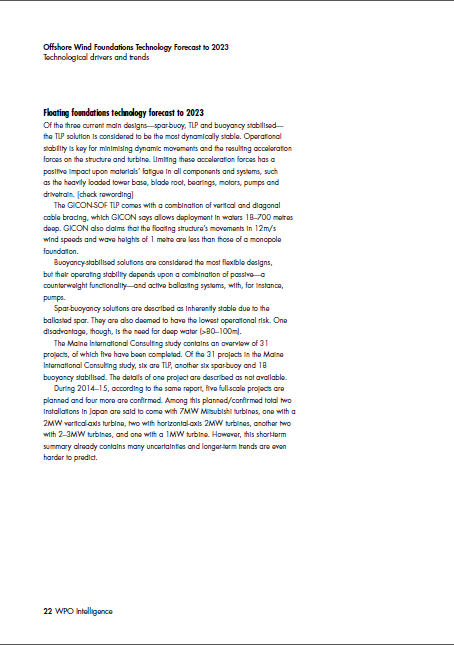 This is in line with recent RenewableUK estimates. Get 3 reports for the price of two!